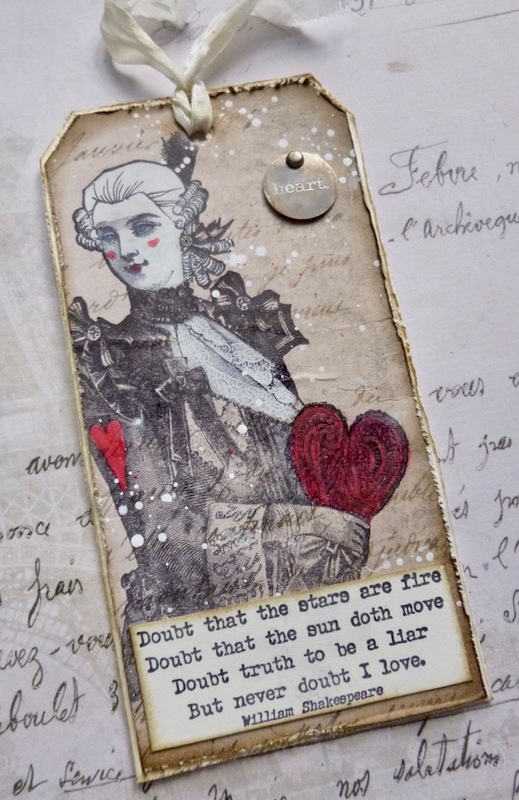 Hi everyone, Alison from Words and Pictures here, and I'm thrilled to share with you my newest release for PaperArtsy of three more stamp sets full of glorious words. For this release, I was thinking about how we could really do with as much love, affection and positivity as possible in our increasingly fractious world. So these new collections have themes which follow that idea. We have EAB09 The Love Edition - perfect for Valentine's Day, obviously, but also for just letting the people you love know about it every once in a while. If you want to do the same for your friends, then EAB10 Friends & Friendship will help you out. 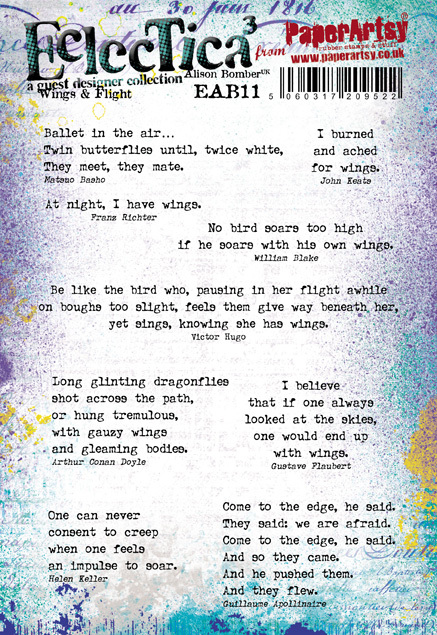 And for the perfect lift-off into the new year, there's EAB11 Wings & Flight - some of them quotes about the birds and the butterflies, but all of them about the idea of allowing yourself to take flight too. Over the next few days, we will be sharing ideas with my newest products by myself and two of PaperArtsy's lovely talented bloggers. You can also see ideas on Instagram, Facebook, Twitter, Pinterest. So no matter what your preferred social media platform, we will be sharing with you! Happy New Year! 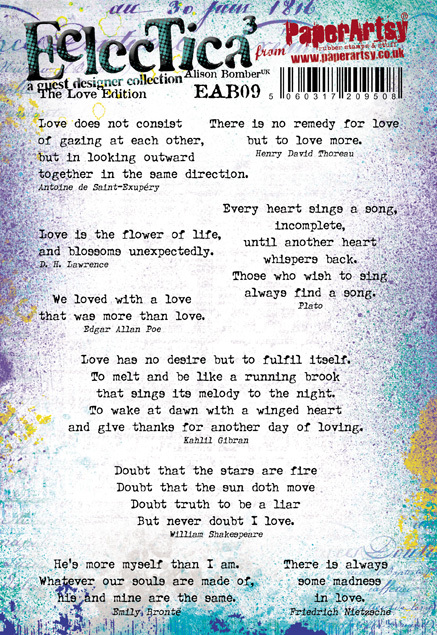 These quotes about love will work for more than just a Valentine's card - they have humour and philosophy as well as romance to offer. 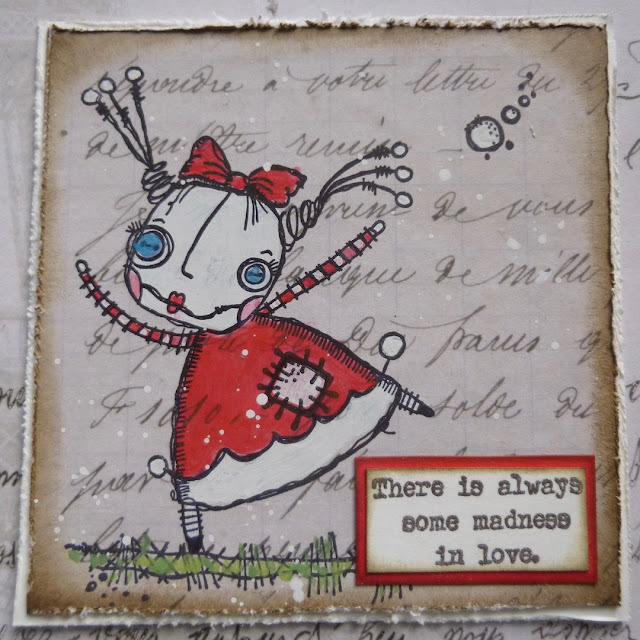 I love combining the quotes with the Zinski Art characters, putting ideas in their heads - she's clearly head-over-heels! 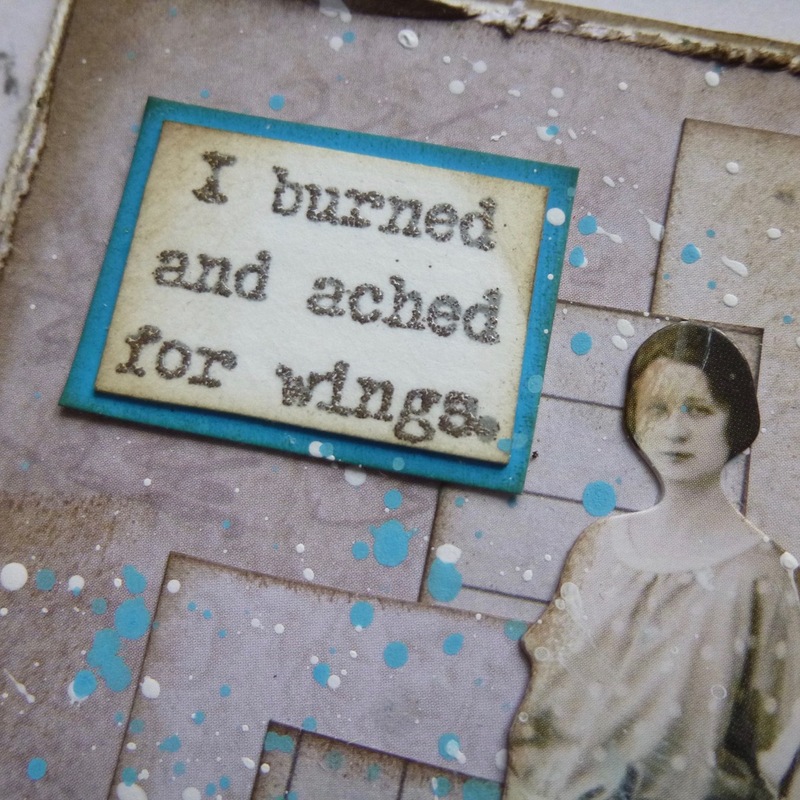 - but I can also imagine this Nietzsche quote on a journalling page or tag. The sheltering branches of the Urban Snapshots Nature tree are perfect to capture Coleridge's idea about friendship. I love that, with the right words, a simple tag can become deeply meaningful. Again, this would work on a card - a thank you to a good friend - but also has so many possibilities as a journalling prompt. 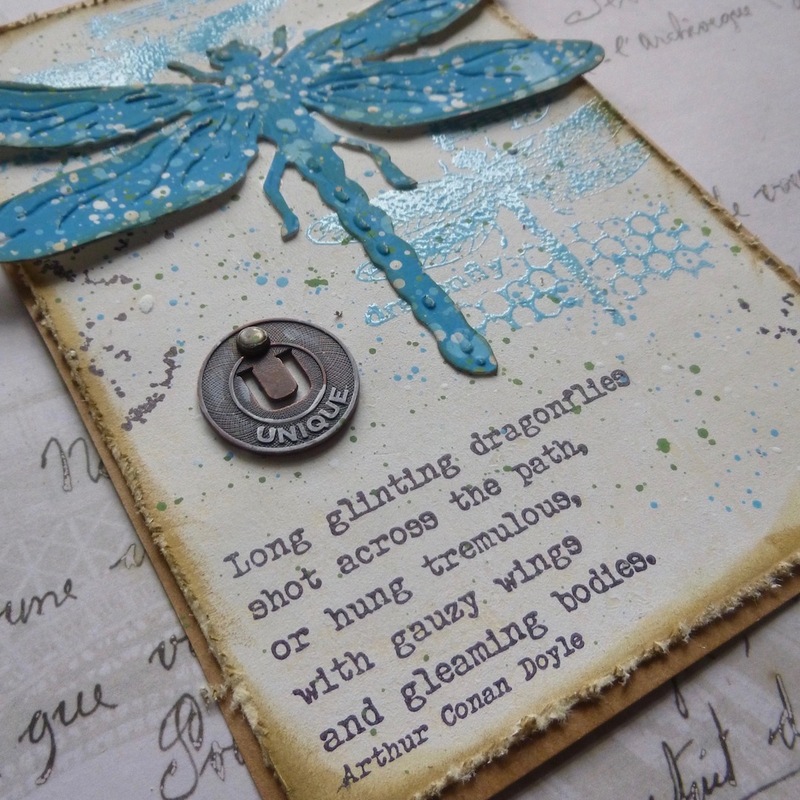 The shimmer of the Eclectica³ Sara Naumann dragonfly stamp is a perfect partner for these wonderful words from the man who gave us Sherlock Holmes... clearly he had a poetic side too! 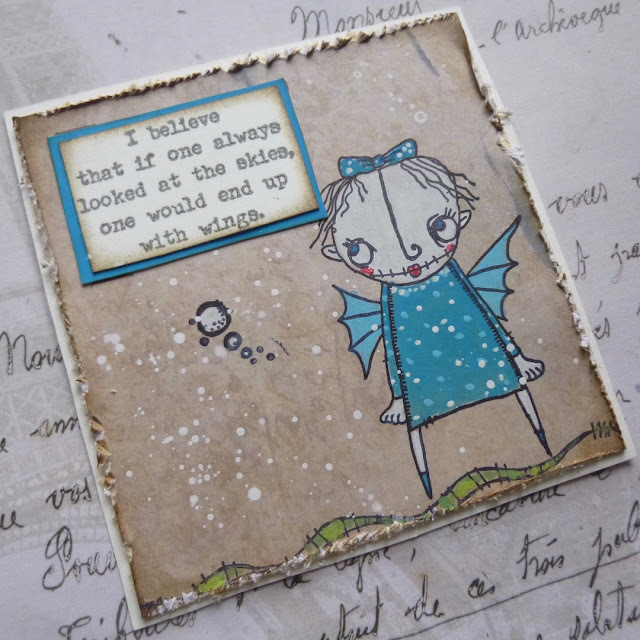 I was delighted to see so many more perfect partners for the Wings & Flight set amongst the new releases at PaperArtsy this January - there are going to be so many ways for us all to take flight with tags, cards and art journal pages. Obviously, I can't really double-up too many of my quotes onto one project... it would start to get confusing with so many ideas coming at you! 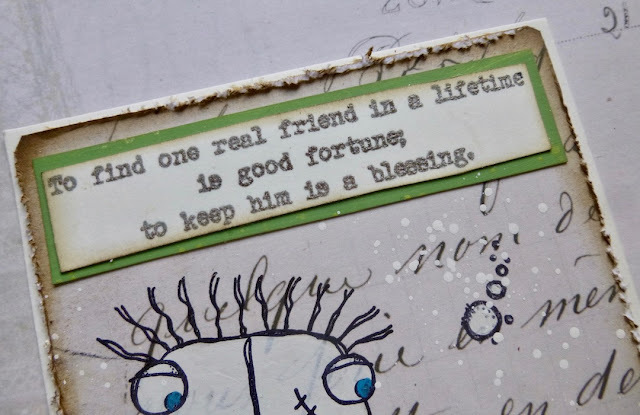 So instead, I'm going to quickly share some pictures of a few ideas I've had for combining the words with other PaperArtsy stamps, or with ephemera and die-cuts, to bring the words to life. 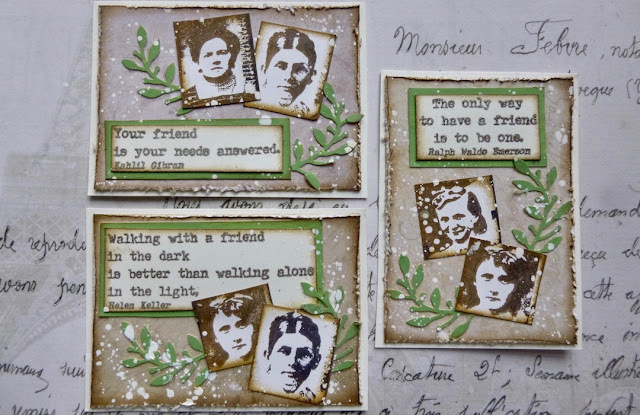 I'll be sharing more details of these creations over at Words and Pictures in the coming days, so do drop by to see me there if you'd like to see some more close-ups and to find out more about how they were made. 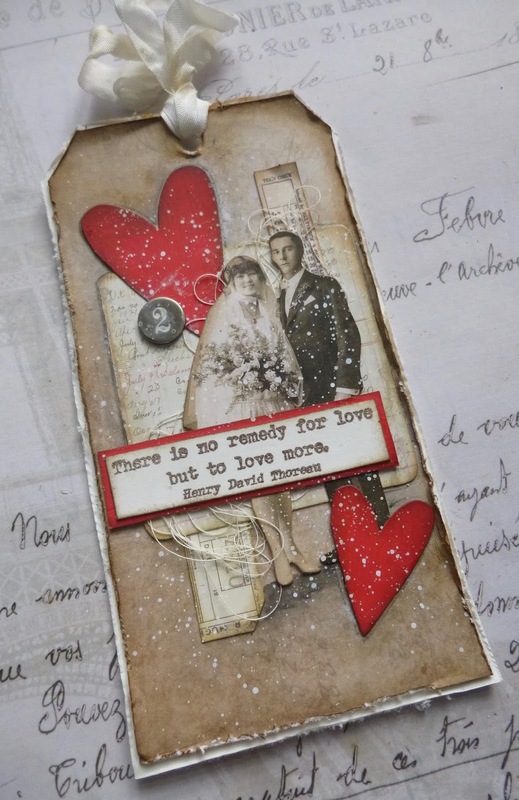 This tag uses collaged ephemera over a design paper background, all in my favourite neutral tones... but then that vivid pop of red for the die-cut hearts tells you we're in the world of love and romance. 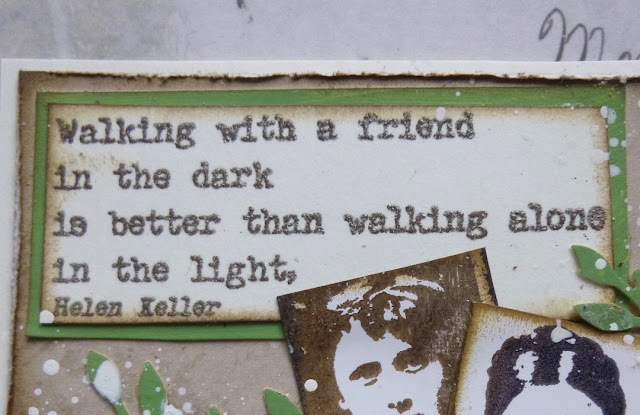 And the words are embossed in delicious Earth Tone Pepper powder by Wow, and mounted on some more of the card, painted in a mixture of London Bus and Cherry Red Fresco Finish Chalk Acrylics. Sara Naumann's hearts were just the perfect pick for this pair of Valentine's postcards... the Valentine postcard stamp across the top is from one of her sets too. The London Bus/Cherry Red combination is back in action to make those hearts pop against the vintage neutrals. 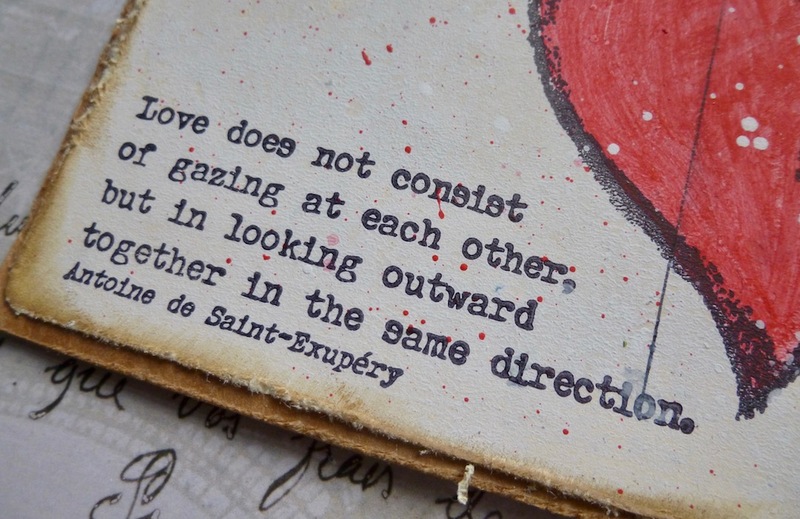 This Antoine de Saint-Exupéry quote is a long time favourite - I think there's such truth in the words... at least for my idea of long-lasting love which can grow. 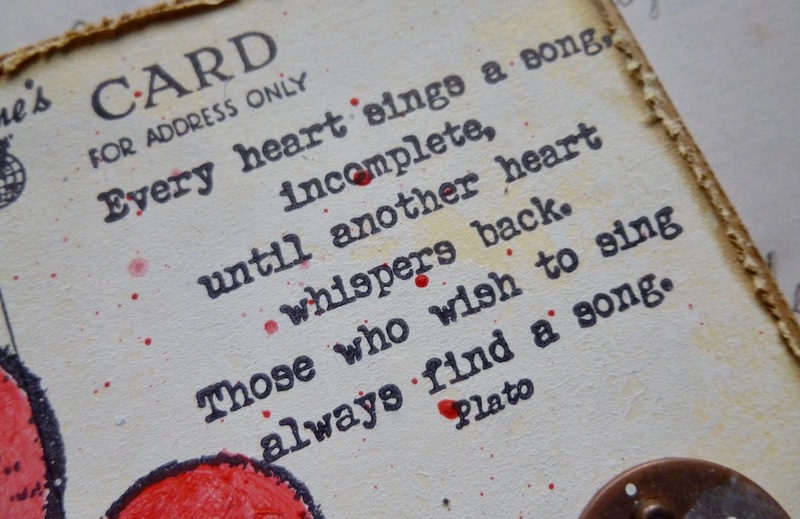 And given my love of music, Plato has also hit the nail on the head here as far as I'm concerned. I can imagine so many ways to use this quote... or you could just use the last two lines of it, of course. This glamorous courtier by Lynne Perrella, delivering his Valentine heart card, sprang to mind immediately when I decided I wanted love hearts to play with. He's the perfect cavalier with the perfect romantic message. And for that romantic message, you can't beat a bit of Shakespeare. It's not from Romeo and Juliet, though. 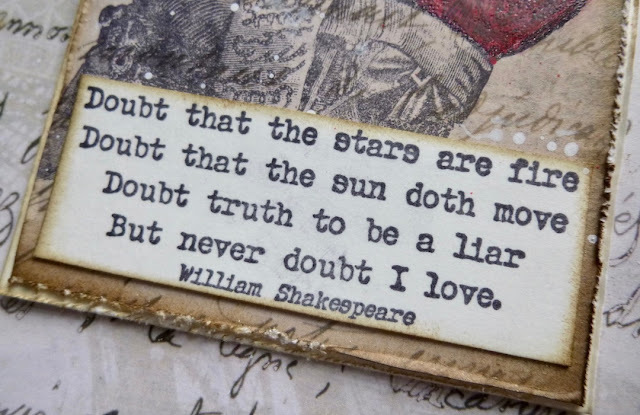 This one's from a love story which turns out just as badly, I'm afraid - between Hamlet and Ophelia... but it's a lovely thought while it lasts, don't you think?! I mentioned near the start of this post that I enjoy pairing my words with the Zinski Art characters, and this was another match made in heaven - not only the words with the pictures, but these two chaps with one another. We're still in vintage neutrals with a pop of colour, but now our main colour is green - Magic Moss and Granny Smith Fresco Finish Chalk Acrylics. 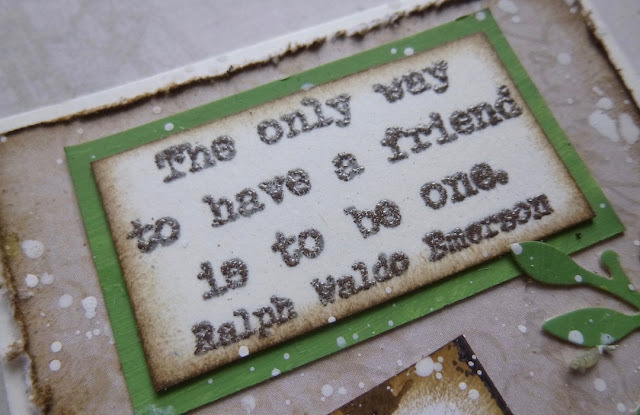 I certainly feel blessed in the friends I've found and kept, male and female, so there was one of those "I recognise that feeling" moments when I discovered this Baltasar Gracián quote. 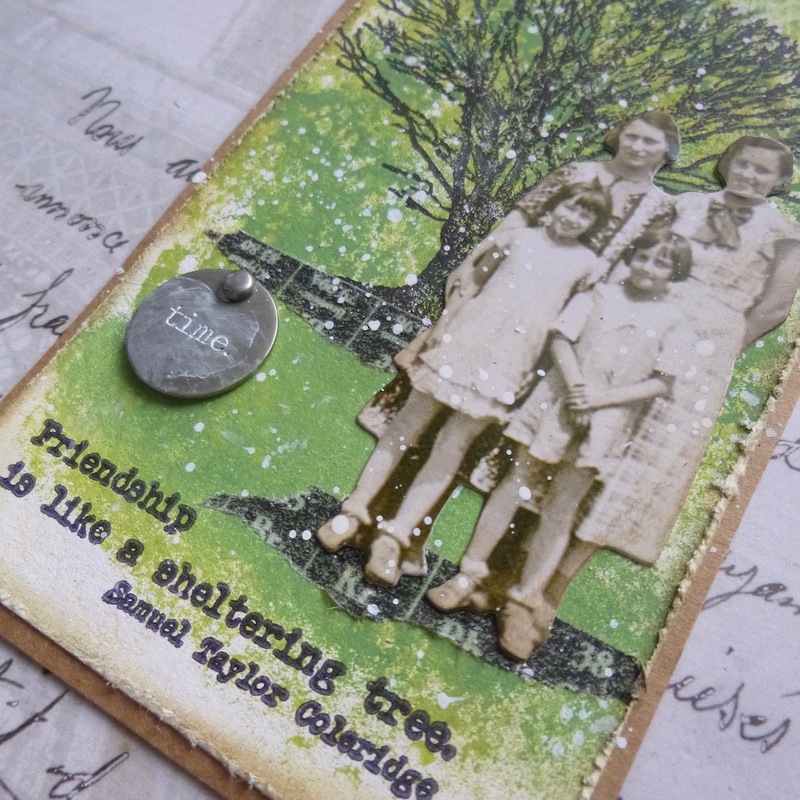 It just had to be part of the Friends & Friendship collection. 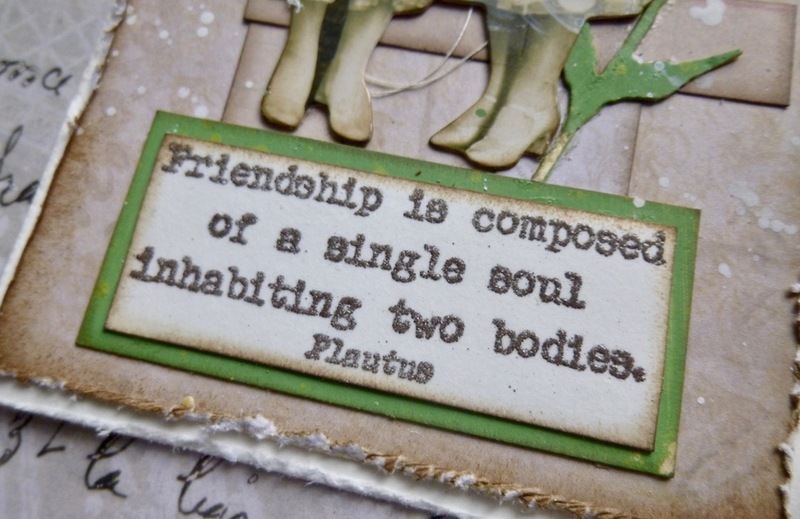 The Idea-ology Paper Dolls are back in action here... just the right friends to go with this wonderful Plautus quote. 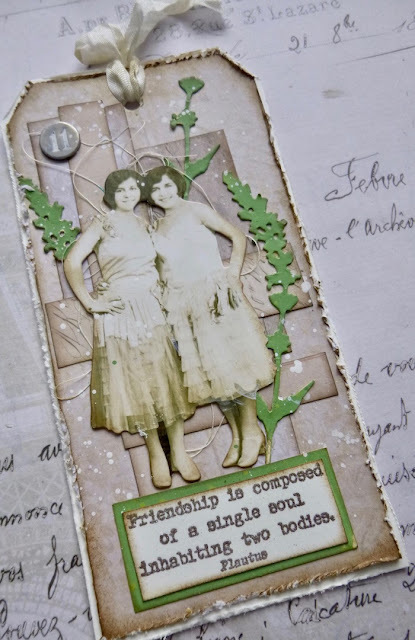 The collaged ephemera in soft neutral tones are given a bit of a lift with some vivid green stems painted in Magic Moss and spattered with Granny Smith. The Earth Tone Pepper is back in action on the quote, framed with some more of that lovely fresh green card to make it pop. 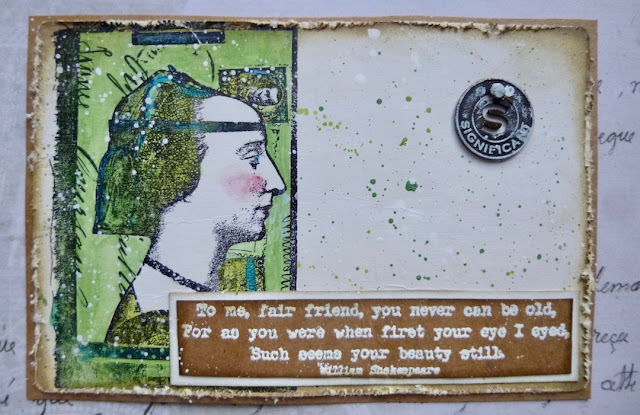 Funnily enough, Shakespeare and Lynne Perrella have paired up again for this large postcard. It wasn't a conscious choice, they just seem to have gravitated together. I suppose it makes sense that this beautiful medieval woman, preserved through time, should have leapt to mind for one of my favourite quotes of all time. 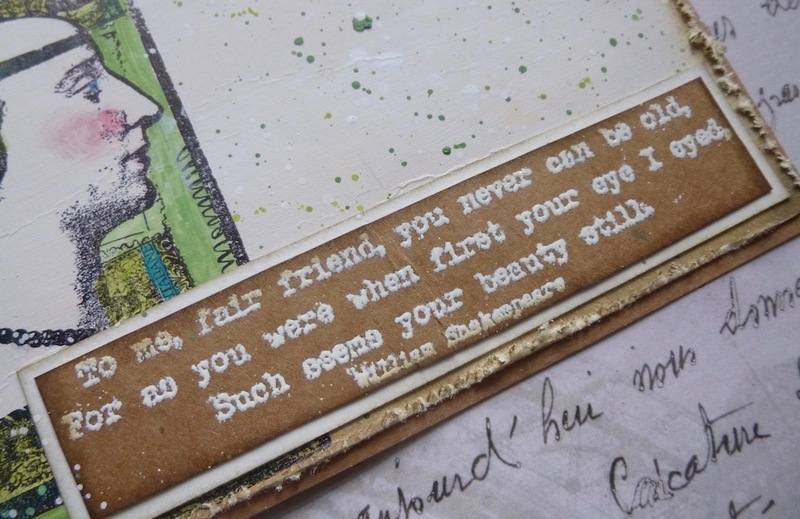 These words come from one of Shakespeare's sonnets, and they've appeared in more than one project since I started crafting. Now I have them ready and available whenever I want them. And it's another of those ideas you recognise... the people you love don't seem to age, they stay beautiful in your eyes. 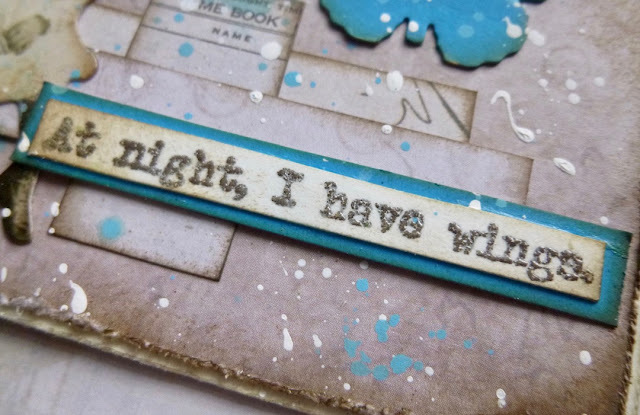 ... and then those words, done in lovely peppery embossing powder again. I can see these being so useful on cards, on tags, and on journalling pages. The perfect celebration of friendship. Naturally, for the Wings & Flight stamp set, we have to head off into the wild blue yonder. So the pop of colour added to our neutrals now is a combination of China and Smurf Fresco Finish Chalk Acrylics. You'll see the green and red put in tiny appearances, but when you take off, it has to be into a blue sky! 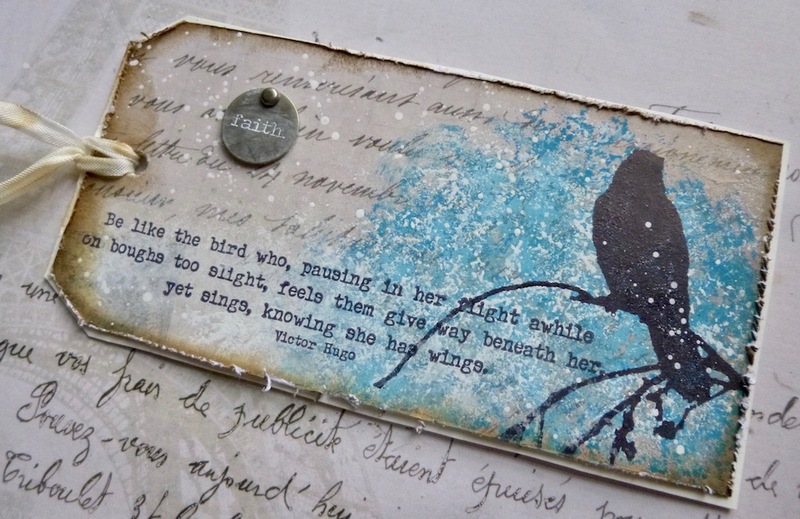 The Sara Naumann bird is resting its wings awhile on the sponged background. That branch may look a little fragile, but never fear... that's what the wings are for! Another little Zinski Art treat now... I could hardly believe how perfectly the words and pictures aligned for this combination! This will be a much-used quote for me, I think - it has such a quality of hope and imagination about it. But I'm not sure I'll ever find a better "direct translation" of this thought into an image than I have with this Zinski Art girl. Project Three: Where are my wings? 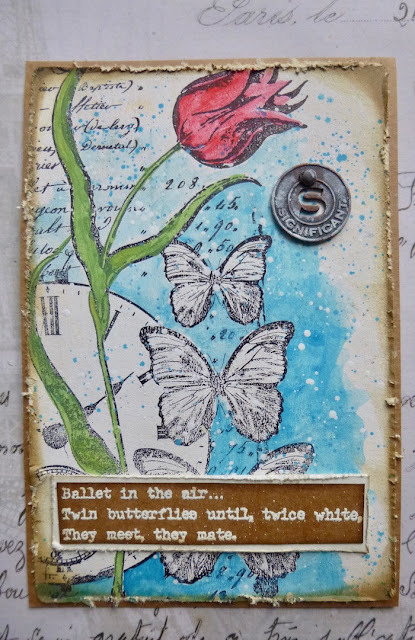 This pair of ATCs uses two of the shortest quotes on the stamp plate. 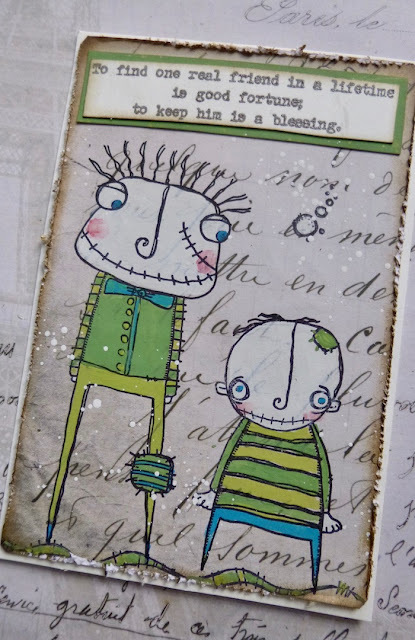 They're perfect for a tiny make like this - with some of the smallest Paper Dolls - or on the pages of a mini album, for instance. 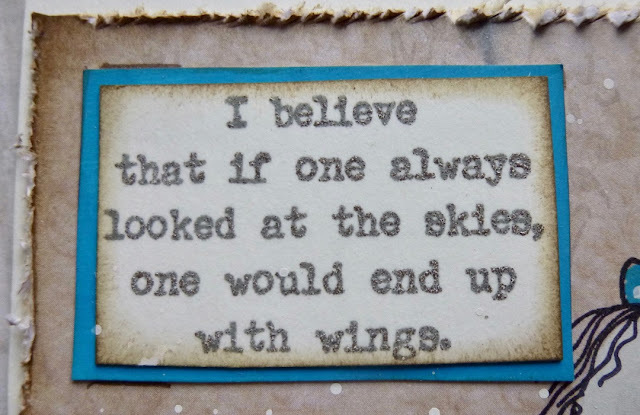 You can feel the yearning in this John Keats quote, the desire to fly free. As a journalling prompt, it would be amazing. 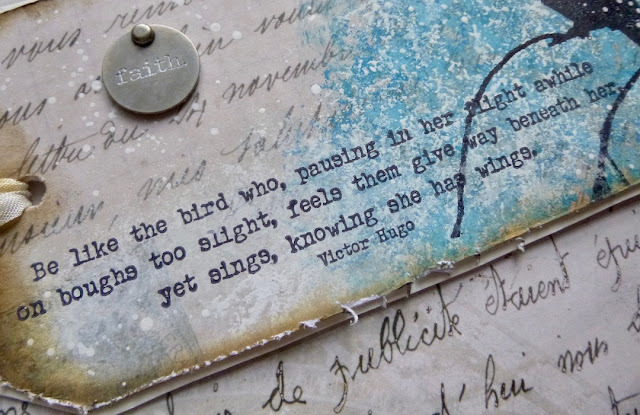 And Franz Richter knows exactly where his wings are - in his dreams at night... and then all things are possible. It's another wonderful thought which causes my imagination to soar. ... and the haiku from seventeenth-century poet Matsuo Basho. 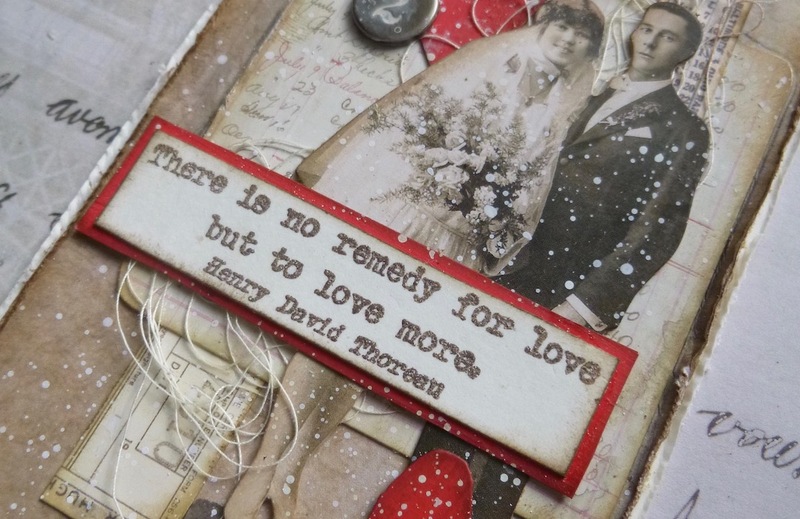 (I do love a bit of white embossing powder for these words.) 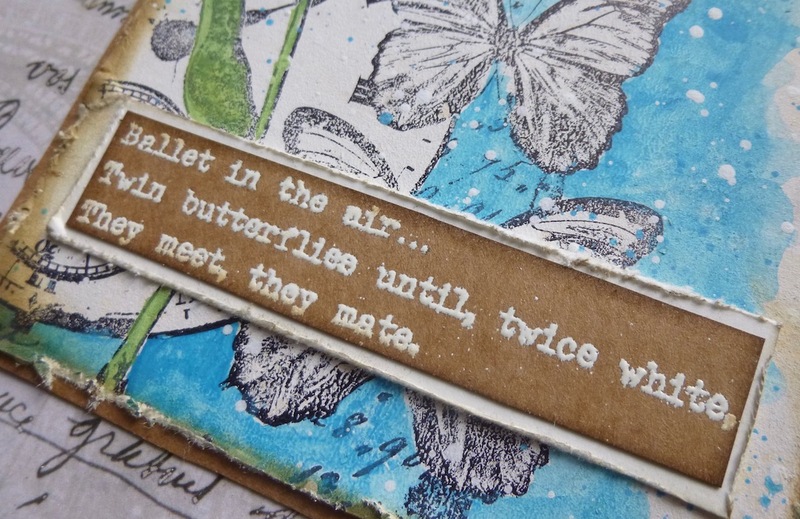 You can hear the flutter of the wings in those dancing syllables with their whispering consonants. I'm sure it's even better in the original Japanese! 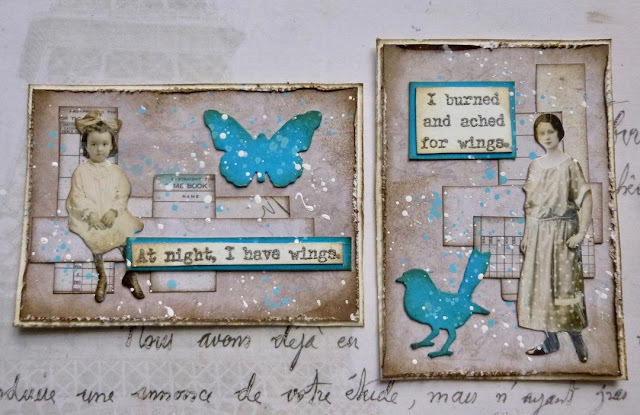 I hope these new sets of words will inspire your imagination to soar - taking to the air with Wings & Flight, or choosing to share your love with the Love Edition, or to let someone know how much they matter to you with Friends & Friendship. It seems to me we need all the positivity we can get as we head into 2019, so I hope you'll find as much joy in these words as I do. 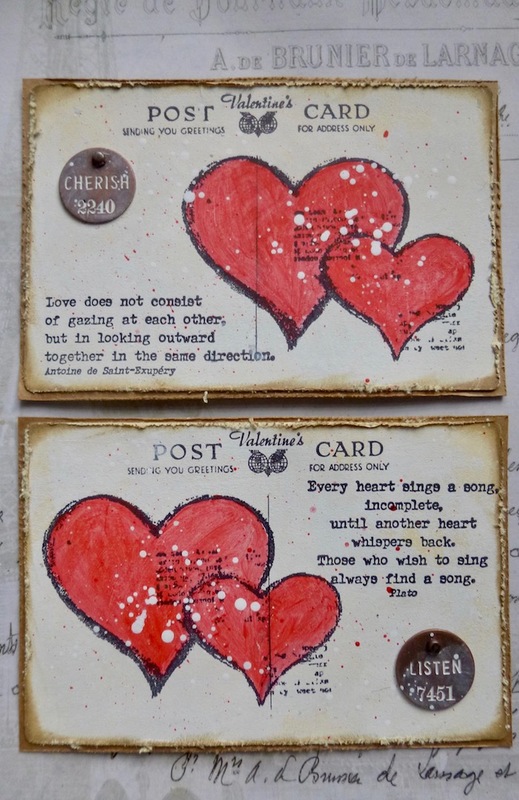 Do watch out over the next couple of nights to see these new word stamps in the hands of two more of the fabulous PaperArtsy design troupe. Thank you so much for stopping by, and I'd love to know what you think of the new quotes. Happy crafting all! oh my, wow, Alison!! As always, you find the perfect quotes for each set, and I need them all - and as always, your samples are breathtaking in their beauty. going back over to drool over them again now. Congratulations, Alison! What a beautiful collection, with positive thoughts and deep feelings. My favourite quote remains the one of St Exupéry but each one has its interest and you made gorgeous nests for them. Such beautiful and wonderful new sentiment stamp sets. I love how you've combined them with the stamped images. Glorious inspiration....Thank you x. So many words, so many samples! But all fabulous, Alison! Beautiful words and samples! Congratulations on the release Alison! I love it!! 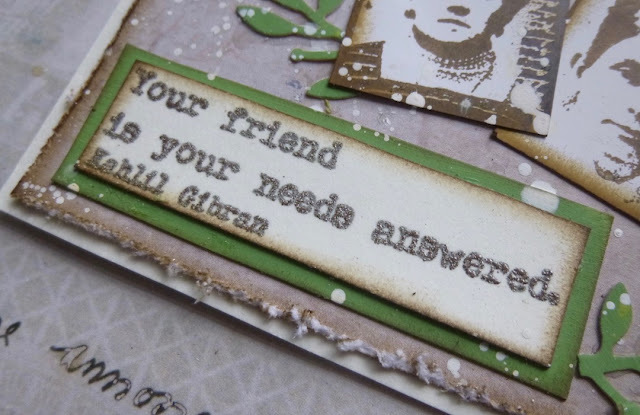 Gorgeous samples and Love the word stamps! I will be adding these to my stamp collection for sure! Congratulations on the releases! What an amazing collection and so many samples. We have been truly spoilt!! Beautiful new quotes on these three new stamp sets, congratulations again Alison! 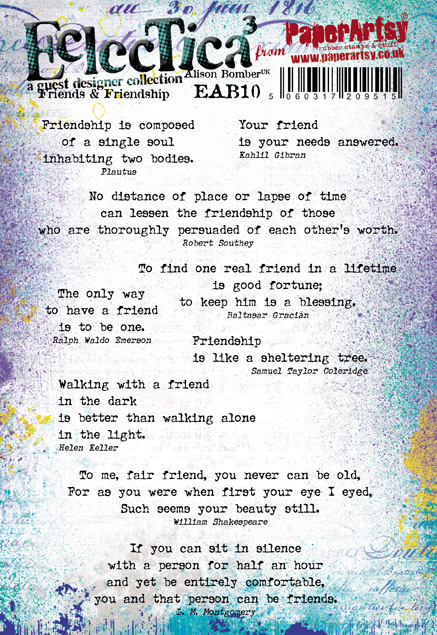 A wonderful collection of uplifting words/quotes! And Alison's samples are just amazing! Congratulations again Alison! What a beautiful assortment of artwork ,all graced with your wonderful collection of quotes! I love each new set and will have to add to my "Alison" growing collection!